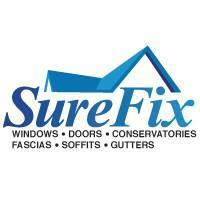 Surefix Home Improvements Ltd - Fascia/Soffits/Guttering, Windows/Doors/Conservatories based in Waterlooville, Hampshire. Surefix are a family run business, we are proud to have been trading along the South Coast for over 22 years, mostly trading on word of mouth and reputation. We cover all aspects of double glazing and conservatories from the initial design to supply and installation. We also have a dedicated team for roofline work including replacement fascia, soffit and gutters. We have vast experience in repair work, including replacement double glazed units, hinges and handles for your existing windows and doors. No salesmen or transient sub contract workers are employed by us; meaning you will always know who you are dealing with. The Surefix Petersfield Showroom is now OPEN, We continue to trade from our Waterlooville showroom, but you can also find us at; 5 Chapel Street, Petersfield, Hampshire, GU32 3DT.